Baby bottle tooth decay also known as early childhood caries is a syndrome characterized by severe decay in the teeth of infants or young children. Baby bottle tooth caries is very common bacterial infection. Start early and save dental trips. Bi annual dental checkups are recommended for the entire family including your tiny tots. The first tooth appears before a child’s first birthday. Ask us how to be dentally aware to prevent early cavities. Children need oral health care just like adults. The milk teeth function best when they are healthy and well cared for. Unfortunately, children often have difficulty caring for their teeth well and so get dental problems. 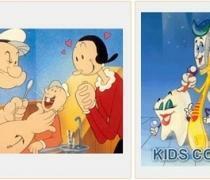 Pediatric dentistry is one of the most neglected fields of dentistry. It deals with the managment and treatment of children and maintainence of their oral hygeine. A child's first visit to the dentist should be enjoyable and positive. The more you and your child know about the first visit, the better you will feel. 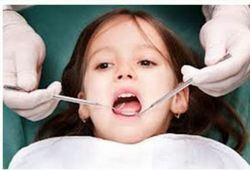 Children are not born with a fear of the dentist, but they can fear the unknown. Our office makes a practice of using pleasant, non-frightening, simple words to describe your child's first dental visit and treatment. Most children do not like brushing their teeth, but parents have to inculcate these habits strongly from childhood to prevent decays and cavities. Decay frequently begins in the irregular grooves on the biting surfaces of the teeth, especially the back teeth. These grooves are difficult to clean thoroughly - a toothbrush bristle does not penetrate to the bottom of the fissure.